USJETAA partners with the U.S. Embassy in Tokyo to award microgrants (grants of small amounts of funding) to current JET Program(me) teachers from the Unite States to support projects they hold in their schools and communities. The grant program concluded at the end of July. 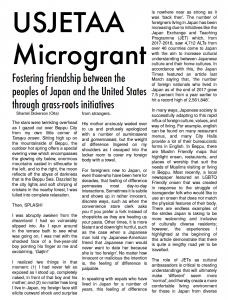 JET alumni Shantel Dickerson (Oita, 2016-2018) wrote an article on the Microgrant Program for AJET Connect Magazine and you can read it here. A variety of cultural events took place in different locations around Japan. These events were open to students, community members, and whoever else wanted to join. Themes included "Winter Holiday Fair," "Scholarship fund,"A Discussion on Japanese-American Identity in Japan and the US," "Tokushima's Got Talent," "Speech Camp," "International Day," and "2nd Annual American Day." These events successfully aimed at highlighting various aspects of different cultures, including the diversity of celebrated holidays, the diversity of different identities found in the United States, American pop culture inspiring children to want to learn English outside of the classroom, raise money for future study abroad goers, JET ALTs from outside of the U.S. sharing their own culture and more. These sessions were held to debrief students who will be studying abroad in the United States, highlight the difference between loans and grants (there is only one word in Japanese that can mean both loan and grant), and create outreach for students who may want to study abroad in the future. Although informational, these sessions also had activities in order to create interest for the students to engage with the information. The Long-Term Projects conducted this year focused on English language ability. These programs focused on the creation of an English language book section at the school's library; one such school even hosted a book reading for the community to attend and another chose books based on either targeting specific reading abilities or subjects such as a female main character of Japanese internment camps in the United States. The children of these schools were very excited to have access to a variety of books in English that will be there for future students as well. 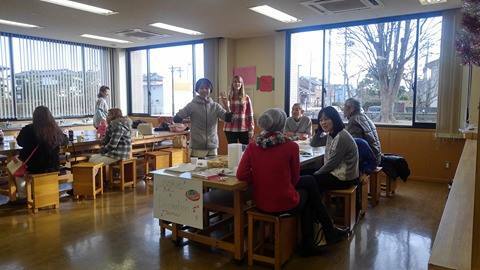 Various penpal exchanges were conducted between Japanese and American schools. The students were happily engaged in the projects, as they were able to communicate in English with each other and share interesting things about each other's culture. 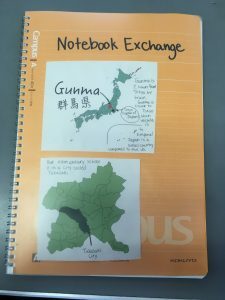 One exchange even utilized notebook exchanges, where students would write about their daily lives, pictures, and other interesting topics. A few unique projects were conducted to engage students with the use of English. These included "Tool to Facilitate Learning and Self-Evaluation," "English Immersion," and "Starting a Student Newspaper." For the first project mentioned, the micro-grant made it possible for the ALT to purchase voice recorders for the students to be able to evaluate themselves in preparation for the Eiken test, a test that has a spoken component and is one of the most popular forms of testing English. These voice recorders will continue to be accessible for students in the future. This project successfully increased not only the number of examinees but also the number of examinees who were able to pass Eiken. Lastly, a month-long project was conducted in which students compiled together a booklet of speeches in English highlighting Japanese customs and traditions. USJETAA is grateful to the U.S. Embassy Tokyo for its support of the JET Micro-grant Initiative for American JETs. The Initiative was publicized on the USJETAA website and shared via social media outlets. 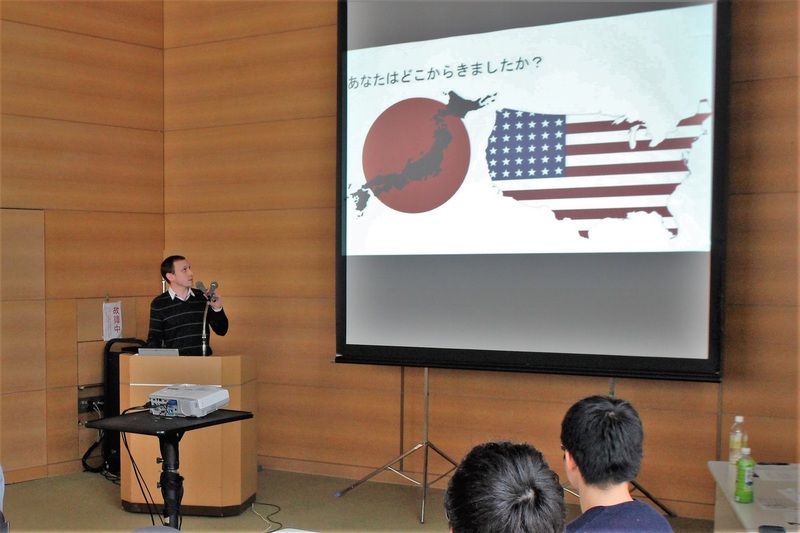 In addition, current JETs learned of the opportunity through the Embassy’s presentation in Tokyo. The application was posted on, and could be submitted through, the USJETAA website. The deadline for submission was November 15, 2017. USJETAA received 25 completed applications. USJETAA Executive Director, Laurel Lukaszewski, and USJETAA Board Chair, Paige Cottingham-Streater, reviewed all applications. Though virtually all submissions were well-written and thoughtful, USJETAA focused on projects that engaged students in direct experiences or exchange, as opposed to more passive activities. The recipients received funds through wire transfers, either to their U.S. bank or their Japanese bank account. Initially there were issues with funds being transferred to Japan Post accounts, but after a number of bank visits, eventually all funds were received by grantees. The wire transfers were handled by the USJETAA Treasurer, Keith Krulak. Grantees submitted an interim report regarding the status of their projects in December and are in the process of submitting their final reports this spring. Laurel Lukaszewki corresponded with most grantees throughout the process, answering questions and following up on money transfers and reporting guidelines, until she stepped down and Treasurer Keith Krulak handled the grant until the new Executive Director, Bahia Simons-Lane, transitioned into her new role. In all, the projects were successfully implemented and appreciated by both the JET grantees and their students and communities. All final reports were provided under separate cover via email to the Embassy. We were particularly pleased with the creativity and enthusiasm of the JET teachers. They all created engaging, memorable projects for their students, and took the opportunity seriously. The projects that seemed most successful were those that involved information and guidance regarding exchanges for Japanese students planning to study abroad in the United States. In fact, we were particularly impressed by the seminar conducted by Teresa Fong, discussing the differences between scholarships and loans for study abroad. This project provided not only informational and educational, but included activities that were enjoyable for the students. Another project that was unique and meaningful was the event by Shantel Dickerson that explored Japanese and American cultural identities through lectures and discussion. This event was bilingual, interactive, and had over 50 attendees from the community. This year we conducted a survey of the micro-grant recipients to get feedback on improving the program for next year. The recipients had a few comments on how to improve the Micro-grant Initiative. One JET requested Japanese translations and explanations of the program to help facilitate communication between JET and the Board of Education. Another JET recommended advertising for this initiative sooner. They also recommend furthering outreach to JET prefectural advisors. Another suggestion, was to provide the reporting documents immediately upon awarding of the grant so that the grantees can easily prepare their reports as they work on their projects. In summary, USJETAA was pleased to be part of the Micro-grant Initiative for American JETs again this year. This program enables us to engage with current American JETs and will hopefully lead to their involvement in JETAA when they end their term on the JET program. We look forward to continuing working with the U.S. Embassy Tokyo to provide this opportunity to American JETs. 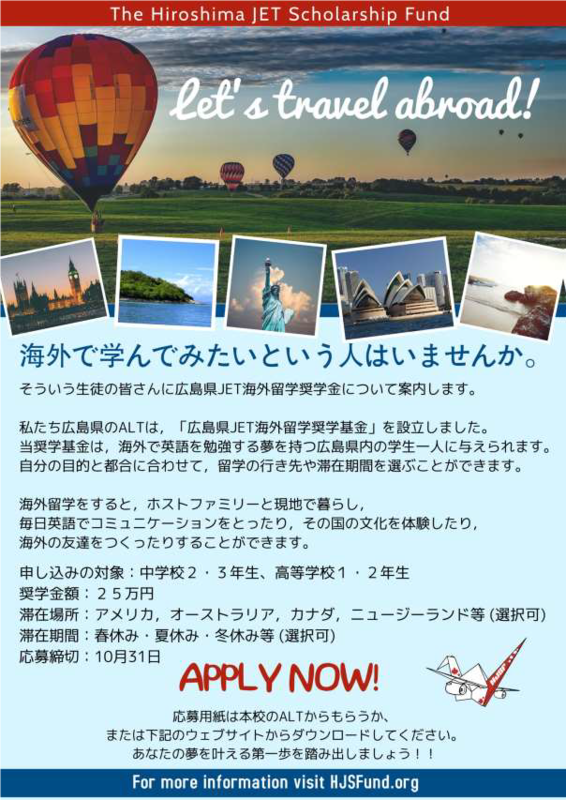 Impact: The grant aided in a pre-departure orientation for a young professional who, after her internship in the U.S., intends to help the tourist industry in Shingu using experiences drawn from her internship. On March 1st, 2018, Shingu JET Giuliana Alfinito, together with the Shingu and Santa Cruz Sister City Committees (hereafter SCCs), planned to advertise the Shingu-Santa Cruz Business Internship Program in the local paper, to local organizations, and online. On March 13th the program was advertised to Shingu’s Young Business Owners Association. The Shingu Chamber of Commerce and the Shingu Visitors Bureau were also informed. 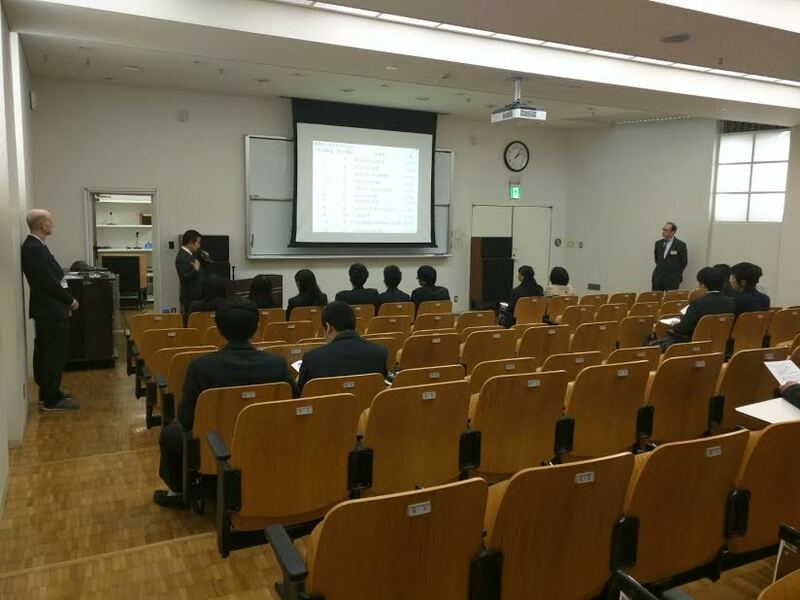 Additionally, a Briefing and Information Session on the program was held for SCC members and interested Shingu residents on March 16th. Four applications were received. 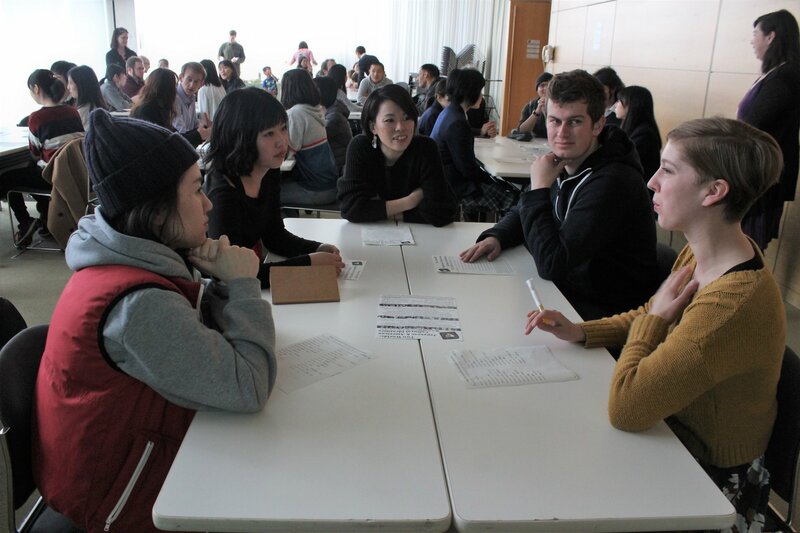 Applicants were required to answer questions regarding their motivations for applying, and how specifically they would use this experience to contribute to Shingu’s society and economy. In addition, applicants underwent an English, in-person interview. Because it was difficult to attract applicants, the pre-departure orientation needed to be in May. The interviews were held on May 18th and 28th. Two interview sessions needed to be held, because one candidate was flying in from Malaysia to interview, and would only be available during the last week of May. The interviews and selection were conducted by the Shingu JET, Shingu SCC members, and an American business culture consultant. The chosen candidate currently lives and works in Malaysia, though she is originally from Shingu, and hopes to move back after participating in the internship. However, she is currently unable to leave her current job and has requested to participate in the internship next year. While the members of the Shingu SCC find this is acceptable, the head of the Santa Cruz of the SCC was on vacation, and was unable to communicate at that time. Therefore, it was decided that the pre-departure orientation would be held the day before the candidate returned to Malaysia, and a second orientation would be organized for next year, assuming the Santa Cruz SCC approves. This second orientation will be partially held over Skype, as the Shingu JET and the American business consultant will no longer be living in Shingu. The Shingu JET and the American business culture consultant worked a combined total of 11 hours to make the materials for and organize the pre-departure training. They made an information guidebook specifically for a Japanese person living and working in Santa Cruz for the first time. The chosen candidate for the business internship plans to return to Shingu and open a guesthouse. She hopes it will improve Shingu’s economy by bringing tourism to the city. Also, she plans to use the guesthouse as a cultural hub for Shingu, where she would like to host local events that will bring together the community. Her experience in Santa Cruz will include working at local co-working spaces and with the Santa Cruz Downtown Association, and Santa Cruz Parks & Recreation. These organizations can provide a new perspective on how she can engage the Shingu community, and better advertise Shingu tourism. The pre-departure training helped to prepare the intern for their experience abroad. It also explained how the candidate can use the rest of the year to get ready for life in Santa Cruz. Thanks to the orientation, she now has the resources and support to improve her English, brace for culture shock, and plan everything she needs to be healthy, comfortable, and safe in a new country. Impact: The grant engaged the local community in learning about the diversity of holidays in the United States through hands-on activities and communication between JETs. In December 2017, Jessica Brooks received grant funding from the United States Japan Exchange and Teaching Programme Alumni Association (USJETAA). This was used to develop and implement a community program called “Passport to the U.S.: Winter Holiday Fair”, a project designed to promote education and cultural exchange between Japan and the United States of America. To highlight some of the multi-cultural traditions of America. To naturally stimulate cross-cultural exchange by creating a relaxed and positive environment that promotes active learning and interaction of foreign cultures and peoples by the local community. 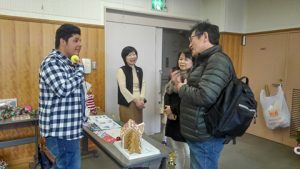 This project was a one-day event that occurred on December 17th, 2017 at Hitachiota Lifelong Learning Center in Hitachiota, Ibaraki. Held from 1 to 6 PM, members of the surrounding populous were invited to participate. Although it was an open invitation, outreach was focused toward those that have had contact with the Hitachiota JETs. This included Hitachiota Board of Education members, JETs from the surrounding area, school colleagues, junior high school students, elementary school students, and their respective families. Due to prior exposure to JETs, the ALT believed that this demographic would’ve been the most open and responsive to the project’s goals. The event was divided into several booths located in two rooms. It was planned that the first room would be for an ornament making and a cookie-decorating booth. Additionally, to enhance the winter holiday theme, this room also offered a hot chocolate and cookie station, a charity station (where participants could donate money to UNICEF), and a guessing area (where participants could guess how many chocolate ornaments were displayed and as a result win a prize). The second room was allocated for the three holiday booths, 2 game booths, and a Santa Photo booth where you could take a picture with Santa. At the game booths, participants could win chocolate and small holiday gifts. The Christmas booth provided a plethora of interactive educational activities including quizzes, pictures, videos of Christmas movies, and music. There were two main issues that arose on the day of the event. One challenge was manpower. Due to unforeseen circumstances, 5 of the 12 JET volunteers were unable to attend. The majority of them were in charge of their own cultural booth or activity. This created a shortage of volunteers and forced a shift in what booths were available. Unfortunately, this included the Hanukkah booth, Kwanza booth, and 1 game booth. Luckily, we were able to revise our roles and work together, which had positive results. An example of this was combining the Santa Photo booth and Christmas booth. Although it originally involved 4 JETs, the remaining 2 combined their booths and promoted each other’s activity. By working together and relying on their pre-existing rapport, they created a welcoming and intimate atmosphere that made participants want to stay longer and have conversations with them. Another challenge was space. Originally, the excess chairs and tables that were in the rooms were to be stored in an unoccupied room. Unfortunately, a few days prior, all of the rooms became unavailable. This meant that we had to figure out how to hide or arrange 50 extra chairs and 10 tables within one of the rooms. This was solved by a JET’s suggestion to stack and put them around the room in a manner that hid them from sight. Prior to the event, the ALT expected around 40 participants to attend. Surprisingly, this number was closer to 60. Many of the individuals that were invited, brought along their friends and family, which expanded the total outreach. The participants ranged from pre-school children to retirees, while visitors stayed an average of 3 hours. The layout and relaxed atmosphere allowed participants to move through the event at their own pace. One observation made was that many of them would spend an average of 10 minutes at each game and Christmas booth. They would then congregate to the other room for about 40 minutes and then repeat the process. Due to the nature of the event, it is difficult to quantify the impact that it had on the participants. Despite this, there are several instances that can be taken into consideration. One method is through participant engagement. A common theme in all three holidays is appreciating what you have and giving to others. Wanting to provide this opportunity at the event, a charity box and simple description of its purpose was displayed. Although the ALT didn’t expect for anyone to donate, the event raised ¥3,000! A further instance of this is exemplified in the reaction of a puzzle and questionnaire that was available at the Christmas booth. To complete it, it required learning information from different booths and asking JETs. It was a huge success. The majority of the participants took the time to fill out the form and by the end of the day there were no more forms left (we originally printed 50). The completed forms not only reveal that the participants were engaged, but also that they were interested in learning. Another method was through conversation. Walking around the rooms, the ALT observed many of the conversations between participants and JETs started off with questions regarding the booths, but progressed into various unrelated topics in both English and Japanese. Discussing with the JETs afterwards, they expressed that on multiple accounts they had in-depth and prolonged conversations with the participants. Moreover, that the participants seemed very comfortable approaching and asking detailed questions about the JETs’ cultures. A distinct example of the impact was reflected in the behavior following the event. On several occasions, the Hitachiota JETs received cards and small gifts as tokens of gratitude on behalf of all the other JET volunteers. One personal experience the ALT had was with one of the JETs that attended. She really enjoyed making the ornaments at the event and asked me if the ALT if they could teach the 1st graders the following week how to make them during class. Prior to this, there weren’t any opportunities with this JET to lead class, but through this event it has opened new opportunities to teach outside of the textbook. The creation and implementation of this project was long and strenuous. For a successful execution, it required teamwork, quick thinking, and creativity. Based upon the number of participants, the average length of attendance, and actions highlighted in the above sections, the ALT can confidently conclude that this project was a success. Through this event the ALT realized the importance of passive and active outreach, communication with volunteers and the venue, and striving to have a surplus of volunteers in case of emergencies. 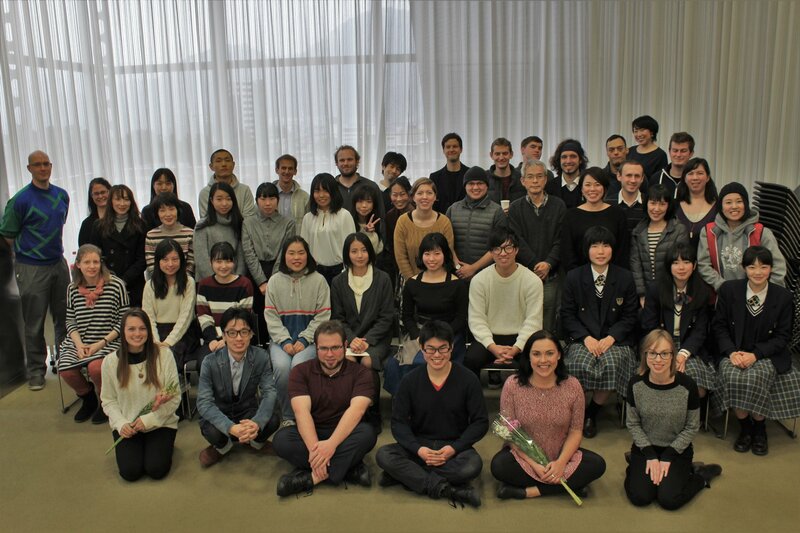 On behalf of the JET volunteers and the greater Hitachiota area, Jessica Brooks would like to express her appreciation and gratitude toward the United States Japan Exchange and Teaching Programme Alumni Association (USJETAA) for granting the project funding. Without it, the Passport to the U.S.: Winter Holiday Fair could not have been implemented as thoroughly, if at all. Impact: The grant exposed children to English through a free story time event at a library. The books were then donated to the library and will be available for continued community impact. The Eigo de Ohanashikai event took place at the Yamatokoriyama Jyo Hall public library on Saturday May 19th, 2018 at 10 a.m. This was the second English story time event of 2018. There were fifty-eight participants ranging in age from six months old to retirees. 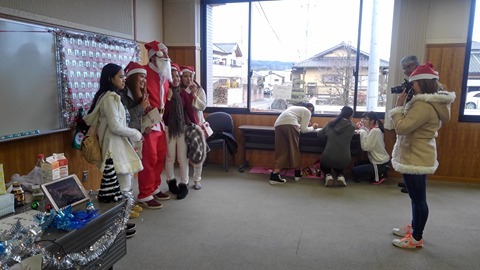 The library staff (Mrs. Aoki) and the ALT (Sarah) read two picture books that introduced the ALT’s hometown (Boston, Massachusetts) to the local residents of Koriyama. The ALT began the event by using vocabulary picture cards to teach words pertaining to the city (ex. buildings, park, bus, statue, truck, fountain etc.) Then, they read Lost by David McPhail. Children enjoyed this charming tale of a local boy from Boston who befriends a bear astray in the big city. After reading the story, the ALT lead a ‘play tour’ of Boston. She showed the city vocabulary cards while children toured the room looking at real pictures of Boston. After that, the library staff and the ALT read Make Way For Ducklings by Robert McCloskey. To conclude the event, the ALT answered a few simple questions about the local culture of her hometown. 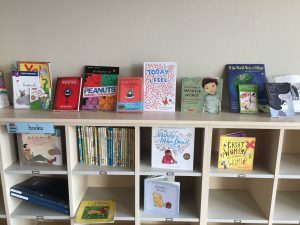 Before saying goodbye, the library staff presented a display of all the new picture books that were purchased thanks to the micro-grant initiative. The children were so excited that they ran over to the display and began perusing the new books. Parents and grandparents also began flipping through the new titles. Many people knew the Japanese versions of the texts and were interested to see the English translations. Finally, the library staff, ALT, and local participants all said goodbye. The ALT interacted individually with each child by giving them high-fives and asking some simple questions in English. There were many smiles and giggles all around. The Eigo de Ohanahsikai event is very popular among children and parents in Yamatokoriyama city. This is one of the few chances available in the city for children to be exposed to English at no cost. The community was very excited to have new books, thus signaling the continuation of the event for several more years. In fact, the children were so excited about the new English titles that most of them were immediately checked out of the library. This event is geared toward small children, but the library staff and ALT try to choose stories that also pique interest for adults. Furthermore, thanks to the myriad new titles, the ALT and library staff can present more books that explore international holidays, traditions, and folklore as a way to expose locals to foreign cultures. Receiving the micro-grant ensures that the Yamatokoriyama community will have continued access to English and cultural exchange for years to come. Impact: The grant promoted cultural exchange and international friendships giving students from the U.S. and Japan experience in intercultural communication. This project was completed over the span of about three and a half months. To start off the project, the ALT conducted a survey in three classes. On the survey, the students were asked: if they were interested in America, what they would want to learn about America, what American things they are interested in, and if they would ever want to visit America. After collecting all of the surveys, the ALT tallied up what the students were most interested in and began the project curriculum. Most of the students were interested in the difference between school, culture, and food. First, the students worked together in groups. Each group had a different topic to talk about. Some of the topics included; school, club activities, rules, food, the town, and people at school. The students in the group also were asked to come up with five questions to ask the students in San Francisco along with thinking of a Japanese word, phrase, or kanji to teach the students in America. Once the students completed the worksheet, they were able to go around the school or local areas to take photos about what they discussed in the group worksheet. They were then asked to explain the picture with captions. After they finished their worksheet with pictures and captions, they were able to input all of this information for it to be sent to the students in America. Once the students in Japan sent their introductions and talked about their school, town, and daily life, the students in America were able to respond to their questions as well as introduce their daily lives. At the time of this report, there have been two correspondences with one another and the students were able to communicate with their American friends as well as learn more about them. The students in America also made a Google survey for the students in Japan to fill out, however it is unclear what they will be doing with that information. experience some of Japan’s culture as well. Impact: The grant promoted awareness of multiracial identity to improve inclusivity and a sense of supportive diversification. On February 25th, 2018, ALTs Heidi Adams and Shantel Dickerson hosted an event titled, Two Worlds: Japanese and American Cultural Identities, at B-Con Plaza Community Center in Beppu City, Oita Prefecture, Japan. The event was a huge success with over 50 participants from various parts of the community. Amongst local community members, there were ALTs from multiple countries, Ritsumeikan Asia Pacific University (APU) faculty, Japanese teachers and students from across the prefecture, and even a group of small children in attendance. The event started with a bilingual welcome from the MC, who then introduced Heidi and Shantel to share about the event’s inception. Lance Stilp, lecturer at APU and editor for Bilingual Japan newsletter, started as the keynote. He gave a broad introduction into the concept of diversity in Japan by looking at language, cultural customs, and even polling his students to see how they feel about diversity in Japan. Christine Pearson Ishi, President of the Association for Foreign Wives of Japanese, followed Mr. Stilp with a very personal talk about raising hafu children, and the struggle over identity in her household. Lastly, ALT Alex Furukawa gave an eye-opening speech about growing up hafu in the US, which she compared to her experience being hafu as a professional living and working Japan. Each speech was about 15-20 mins long, and each speaker posed 2-3 discussion questions at the end of their speech. In groups of about 5 people, including one volunteer bilingual moderator per group, audience members discussed their thoughts and opinions. The workshop was very interactive, and truly opened a dialogue which focused on multiracial identity and what can be done to improve inclusivity towards individuals who don’t fit the mold of what it traditionally means to be Japanese, or to be American. The event came to a close after a short screening of Tetsuro Miyazaki’s crowdfunding campaign for his Hafu2Hafu photography project. Mr. Miyazaki had given permission to use his photos on the event flyer. In his video, he talked about his own growing up half Japanese in Belgium, which tied into the event really well. After the event, everyone was ushered out of the room due to time constraints, but the conversations that had started during the event, continued in the hallways. For as small a city as Beppu is, it is also one of the most international in Japan. This event served the many foreigners and their mixed race households in Oita Prefecture, as well as the local Japanese community that continuously strives to be more inclusive and supportive of diversity. Impact: The grant gave students the confidence to use English by having them engage with students in the United States and experience using English for communication. The International Letter Exchange between Hinodai High School and Pacifica High School initially began in November 2017. At the request of the head of the English department, the letter exchange was to be limited to the English Club for two months before being opened to the rest of the school. The letter exchange was not included in the English curriculum and would be conducted on a voluntary basis, and students were not allowed to exchange any SNS information. As a result, for the first two months, my primary audience for this project was fairly small—only the six members of the English Club participated. 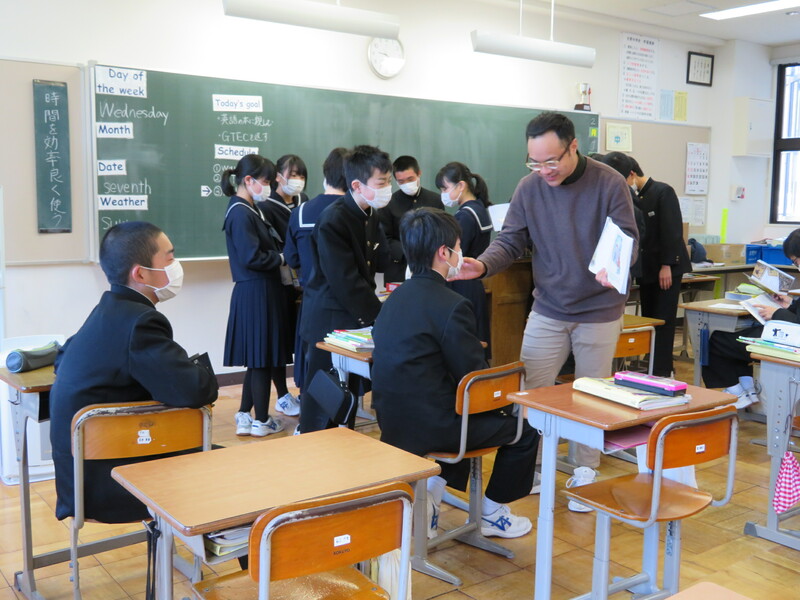 After January, the project was expanded, and 23 Hinodai students from the first and second year grades volunteered for the program. Despite the small scale of the project at its initial stages, the ALT found that the six English Club members had the most meaningful and fruitful conversations out of all the interactions between the Japanese and English students. This was not only in part because they had more chances to write to the Pacifica High School students, but also because time was dedicated during English Club meetings to explain unfamiliar colloquial English phrases and references, as well as elaborate on the differences between American and Japanese school systems. The English Club students also spent time during club meetings sharing their letters and helping each other craft questions to ask the American students. One American high school student inquired about one of my student’s opinions on the bombing of Hiroshima and Nagasaki, which started an interesting discussion during our club meeting about how this portion of history is taught in America versus Japan. 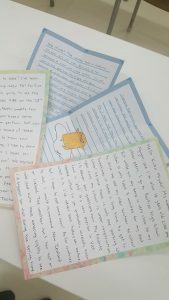 Though my English Club members were hesitant to write lengthy letters in the beginning, slowly they would turn in several pages of writing without prompting. Once the program was opened to the rest of the school, several challenges arose. Because of the voluntary nature of the program, several students did not prioritize the letter writing or the program itself. Several batches of letters were delayed because of a handful of students who initially signed up to be paired, but who would turn in the letters several days to weeks later. The ALT held lunch meetings to offer these non-English Club students the same opportunity to ask questions and to clarify portions of the letters, but not every participant attended these meetings. Collecting the letters was also difficult, because the students were all from different classes and would not always drop off the letters to the English Department on time or on their own accord. Overall, the ALT found that the level of dedication was mixed—some students genuinely wanted to participate in the exchange and steadily wrote more as the program continued. Some students joined out of curiosity, and found the letters to be more of a chore than they first expected. The ALT found that another weak point of the program is the limitation of the students’ exchange of SNS identification. The ALT believes that this truncated students’ chances to continue their friendship beyond this program, and though the ALT understands the school administration’s reluctance to allow students to exchange their contact information with American students they’ve never met, they also found that this was a major setback in the project. Had students been able to exchange contact information, The ALT thinks they might have taken more of an interest in the letters and the conversations with the American students, as they could see the possibility of an actual international friendship forming. Despite the challenges of the program, the ALT believes that the experience overall was beneficial. Students were more interested in approaching them and speaking in English, and several students wanted to ask questions about their own experience in high school. 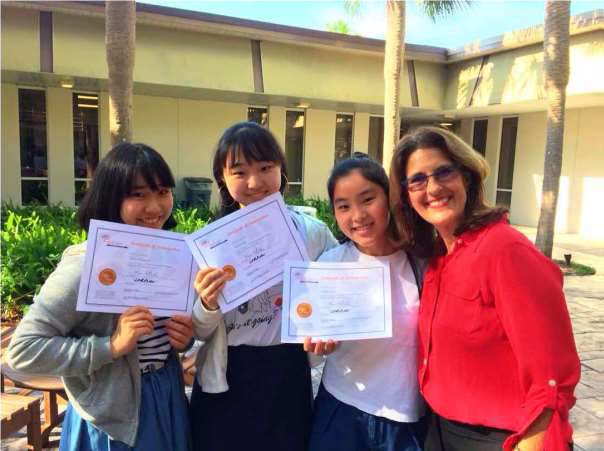 Impact: The grant gave students from Japan and the U.S. insight into each other’s cultures. 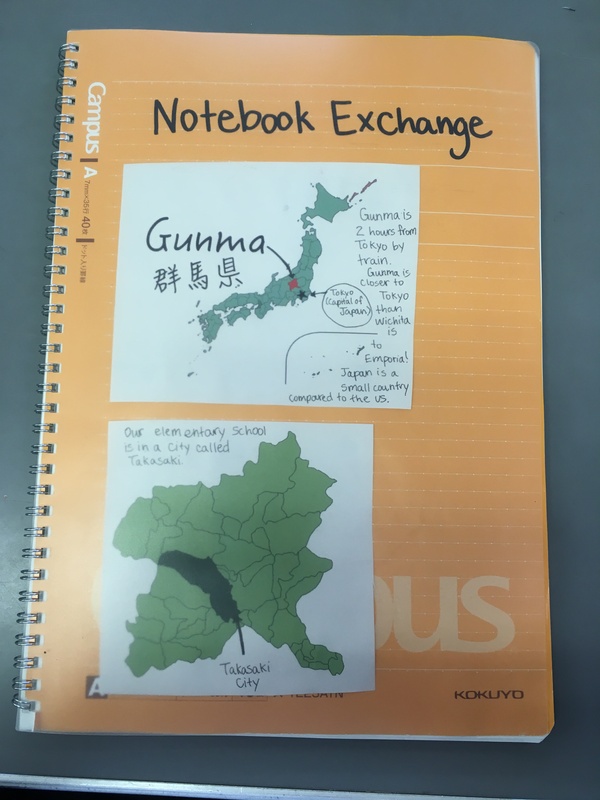 The Kansas (USA)-Takasaki (Gunma Prefecture) notebook exchange project concluded on May 20th with the arrival of Kaneko Elementary School’s notebook in Kansas. 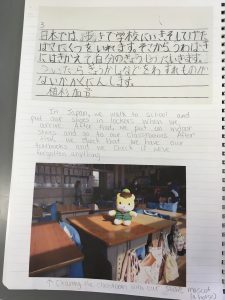 Starting in March of 2017, the 3rd graders of Kaneko Elementary began writing short diary entries about their daily lives at school and also took pictures of Gunma-chan (Gunma’s mascot) around their school. At the beginning of April, the 5th graders of Kaneko Elementary also began writing journal entries about various topics such as games played at recess, topics studied during the day, the process of walking to school, and what is eaten for lunch. Students spent 1 to 2 class periods over a week-long period discussing what they thought American schools might be like, what is unique about Japanese schools, and what might be differences and similarities between the two. The school’s ALT (who was the grant recipient) translated the diary entries and collected them into a notebook along with pictures and sent it to Blessed Sacrament Elementary School in Wichita, Kansas. 3rd graders at Blessed Sacrament Elementary completed a notebook about daily life in an American school, as well and the ALT at Kaneko Elementary School then translated the notebook and discussed the topics with her students. This project’s audience was 3rd and 5th graders at Kaneko Elementary School in Takasaki, Gunma, Japan. Additionally, the teachers, parents, and families at the school also discussed the project. The other half of the audience was 3rd graders at Blessed Sacrament Elementary School in Wichita, Kansas, US. The parents and teachers at this school were also involved in the project. As a result of this project, Kaneko Elementary students spent a significant amount of time thinking about similarities and differences between schools in the U.S. and Japan. The students’ interest in schools and communities in the U.S. increased and their understanding of the similarities between the two countries also increased. Students expressed stronger interest in English and English-speaking countries after participating in this project. Impact: The grant was used to create a relationship with the local Japanese population and was used as an opportunity to send future students abroad. The Shimane AJET One World Festival was held on Saturday, May 26th at the Yusato Machi-dzukuri Center in Oda City, Shimane Prefecture. The primary goal was to foster relationships with various local Japanese people, and to raise money to send students abroad in the future. Approximately 30 ALTs/CIRs from across the prefecture attended as volunteers and/or guests, and about 80 Japanese guests were in attendance as well. After expenses and the use of the grant, approximately 60,000 yen was raised through entrance fees and donations, which will be used towards next years’ scholarship. Entrance fees were 1000 yen per adult, and 600 yen for attendees of high school age or younger. The event itself was planned with extensive help from Mr. Kawabata of the Machi-dzukuri Center. He has expressed a great desire in spreading cross-culturalism, and was integral in everything from the selection of the date to the clean-up afterwards. With his assistance, and the assistance of the ALTs, advertisements were posted at the local middle schools and elementary schools, and posters were put in the Center itself to attract guests. At the event itself, various games were set up to entertain the attendees and encourage interaction with the volunteers running said corner. A professional magician was hired to create balloon art and entertain. Various dishes were prepared by a number of chefs, ranging from taco bowls to baked ziti to cheesecakes. Finally, there were a large number of performers, including an American ALT who is a professional cellist performing Ghibli music, a Japanese student who speaks excellent English and performed many American songs on guitar, and English speeches delivered by past recipients of the scholarship. The event was a resounding success, with food going quickly and many remarks of the entertainment factor. Many ALTs took the opportunity to sit down and eat/chat with the Japanese attendees, and many students showed up even before the event, excited to enter and enjoy the festivities. Impact: The grant helped alleviate fears in regards to funding for international study abroad opportunities by explaining the differences between scholarships and loans. On April 14, 2018, the school held the first 助成金留学説明会 of the 2018-2019 school year aimed at high school first year students who are interested in going on long term study abroad programs and their parents. The event covered tuition, motives for studying abroad, and personal accounts from students who went abroad last school year. In total, 33 people attended the event. Specifically, there were 25 parents and students as well as eight teachers who were not involved in the event organization. The event was successful thanks to the six student presenters and three teachers, not including the grantee. Due to the large audience, the school decided to have another助成金留学説明会in the fall for students potentially thinking about going on short-term programs. The event started with parents, students, and teachers alike registering at the front desk and receiving paperwork as well as one of the many candy bags funded by the micro-grant. Inside each candy bag was a Japanese flyer explaining the differences between “scholarships” and “loans.” The ALT also added chocolate coins with other types of candies to represent “funding money.” Additionally, on the flyer, the ALT directed them to a website she created that acts as a database for resources, including internships, grants, and Japanese sister schools all over the world, aimed towards Japanese students. The event started promptly at 2 PM and the vice-principal, Mr. Nogami, gave an introduction along with the ALT’s supervisor, Brent, the ALT’s teammate, JC, and the ALT. Mr. Nogami explained that funding for study abroad is complicated, for some scholarships have strict restrictions such as not being allowed to accept another scholarship at the same time. Next, the six students who went abroad took turns presenting about their experiences while living in a different country. This portion took a majority of the event as after each presentation, Brent, JC, and the ALT asked questions in English and they answered back in English to showcase their language acquisition. Lastly, Mr. Nogami took the stage again and briefly explained what studying abroad is and isn’t. He dispelled the misconception that studying abroad is essentially traveling for a long period of time in another country and instead, explained that the program Seiritsu students go abroad on makes them become flexible, confident, and culturally understanding. Teresa Fong believes that this event and her speech has put a dent into the students’ and their parents’ fears about funding an international education. The students and parents should now know that funding isn’t one general category; rather, there are many different types of funding with many different criteria and the most important one for them to know about is scholarships. Even more, the ALT thinks that the impact will not only stop at this school. Teresa has created a public database for anyone to use when in search of not only scholarships, but also international opportunities. This database is a working legacy to share information on Japanese sister schools, international internships, conferences, and more in which Japanese citizens can participate in to develop a holistic view on the cultural ties that make up our society today. 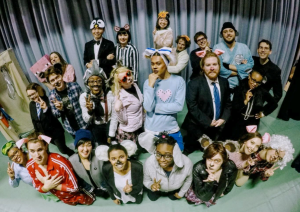 Impact: The grant helped engage students with English outside of the classroom and exposed the local community to the English language and American culture through theater. It increase student motivation for learning English. 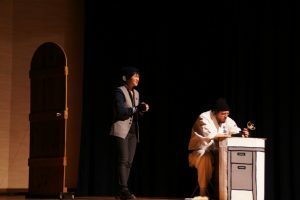 The Tokushima AJET English Musical is an annual non-profit event executed by Tokushima AJET and produced in collaboration with volunteers from the JET and local communities. This year’s musical, the 24th production titled TokuSing, was based on the American animated film Sing and adapted to suit a local setting and background. Preparations for the musical began in September, when Sing was selected by public vote. The script writing process began soon after and was based on the movie and included easy, junior high school level English and some supplementary Japanese lines. 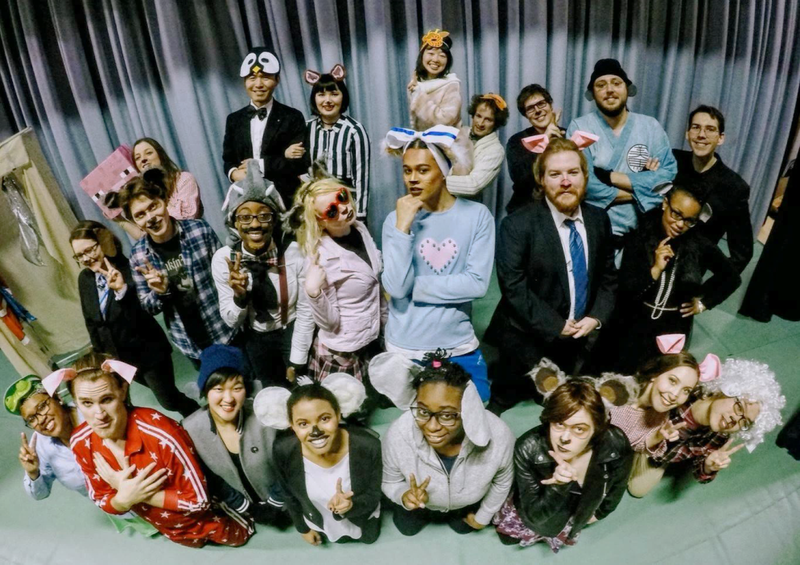 In October, a director and co-director were chosen, auditions held, and cast roles filled. At this point, the cast began individual practice of their parts. Reservations for all of the selected venues were completed in November. In December, with support from this micro-grant, materials for costumes, props, and backdrop creation were purchased. The following month, weekly weekend practices at schools across Tokushima began and props creation and part memorization started. In addition, a promotional poster was created and micro-grant funds were used to print copies for distribution at JET Program ALTs’ schools and at various businesses around the prefecture. Simultaneously, a poster contest for students in Tokushima was held, with the winners gaining special backstage access and VIP seats during the musical show of their choice. The production season took place in March at five venues located in various regions across Tokushima. Admission was free-of-charge and complementary souvenirs in the form of animal masks were provided to audience members. Submissions from the poster contest were also on display at the reception for the show. The total audience from all shows totaled 705 members. Numbers varied at each venue, but averaged about one hundred people per show. About one fifth of the total attendance was of the target audience of school-age children. Although long-term impact of the musical is difficult to gauge at this point, many musical cast members (JET Program ALTs, CIRs, and non-JET participants) reported positive feedback from audience members. A junior high school student who attended the show wrote to her ALT, “I enjoyed TokuSing very much! I want to work harder at English.” The same student later expressed interest in participating in the regional English speech contest, which may be a testament of increased motivation in English studies after watching the musical. Overall, the event seemed to be enjoyable for students and many saw it as an opportunity to engage with English outside of the classroom. Participants: The grant helped improve promotional outreach to give students access to study abroad. 1) Sending two students to study overseas. Since the HJSF Committee filed the Interim Report in March of 2018, it has provided the money to send two students to study English abroad: one to Australia and one to the United States. Money received from the USJETAA Micro-grant Initiative was not used for this, but it was used to reimburse all interviewees’ travel expenses during the most recent interview period, and indeed the HJSF Committee would be remiss if it did not mention that it has achieved its goal of helping send students abroad. Both students returned and submitted reports/summaries answering questions regarding the challenges they faced, the amount of English communication in which they engaged, how the experience impacted their English ability, and their overall impression of their homestay with local families. Both students reported extremely positive experiences in their respective programs, specifically that studying abroad allowed them to interact with other cultures firsthand in ways not often available to them in their day-to-day education and that their English ability significantly improved. As the student who traveled to Australia stated, “by living in Australia and actively communicating, I became able to speak and discuss in my own English without hesitation of my thoughts.” More importantly, their time spent overseas has only strengthened their desire to master English and make it a part of their lives no matter the challenges they may face, as expressed by the student who went to the United States (Figure A) when she reported, “my English was sometimes not understood when I spoke to my host mother. But l used gestures or other easy words. So, I could overcame [sic] it! !” Of great significance for the Committee and the long-term viability of the HJSF, both students also expressed a willingness to help promote the HJSF because they want others to experience that same sense of successful and meaningful inter-cultural communication. Figure A: Scholarship recipient (second from right) with dreams of working at NASA who studied abroad in Florida. The HJSF Committee was able to significantly revamp its website to make it more accessible and user-friendly. On one hand, information is now easier to locate and diverse promotional materials are available for ALTs to download and use in their schools in order to entice students into applying. Students themselves are also provided with a great deal more information than was previously available. As can be seen in Figure B below, for example, not only can students directly download the application itself, but they can also see a list of verified study-abroad programs from which they may choose as their program of choice when completing the application. Figure B: The first two steps in the application process. 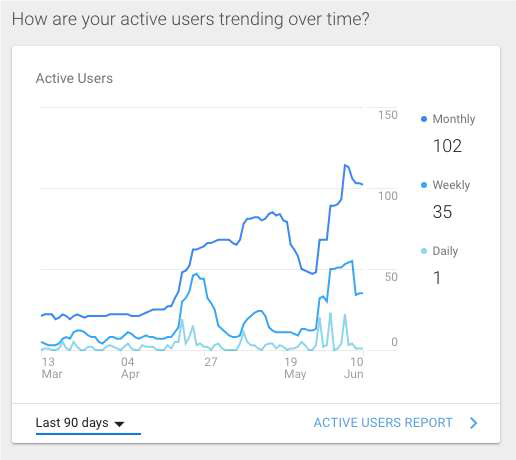 On the other hand, registering with Wix.com webhosting services means that the Committee can view website analytics to get a better sense of who is visiting the website and for how long (Figure C and Figure D). This will allow the Committee to more accurately adjust its promotional activities and website features in order to reach more diverse audiences and help ensure that they spend more time exploring the website’s many pages, with the desired outcome being that they either donate money directly to the HJSF or purchase something from the soon-to-be-completed merchandise page. 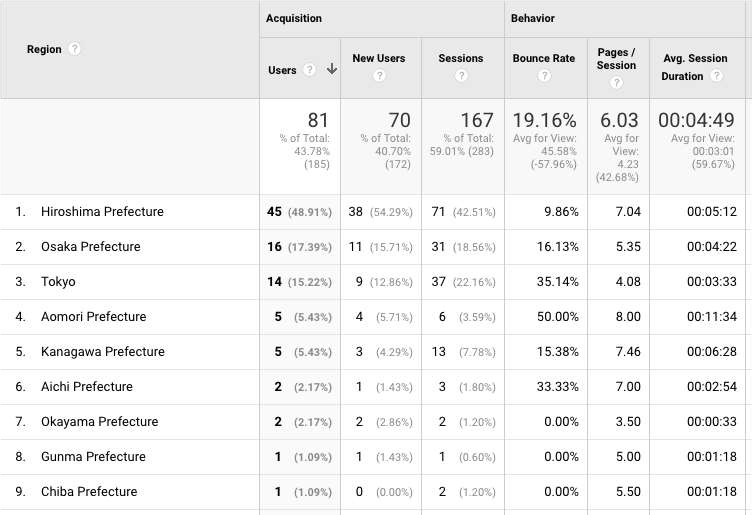 Figure C: Website visitors from the past three months. 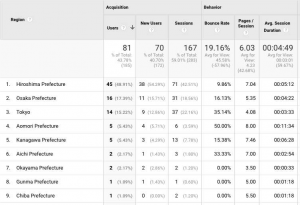 Figure D: Location of visitors and time spent browsing the website. As a final point on this topic, the Committee is also working closely with native Japanese speakers to make sure every page is translated into Japanese, which visitors will soon be able to select from the very first screen (Figure E). Figure E: Initial language-selection screen. The HJSF Committee was able to significantly increase promotion for this year’s application period by, on one hand, aggressively reaching out to ALTs with details about how they can become involved with the HJSF, introduce it in their schools, and help raise money either by donating or purchasing goods (Figure F), the latter of which can be done at any time by contacting one of the HJSF Committee members. Figure F: Reaching out to ALTs to ensure active involvement and interest in the HJSF. Much of the direct, face-to-face recruiting and promotion done by the HJSF Committee is at the HJSF-sponsored events as well as the two annual conferences: the August Orientation and the January Skills Development Conference. Regarding the former, the website has helped bolster the HJSF’s social media presence in informing ALTs of how they can become involved. Regarding the latter, the Committee believes that the foundation that was set these past few months in more aggressively reaching out and encouraging ALTs to talk about the scholarship at their schools will have a positive impact on the number of applicants this year. Unfortunately, the extent to which this holds true cannot be fully ascertained until the application due date of October 31, 2018. On the other hand, and much more significantly in terms of promotion, the HJSF Committee set an ambitious goal for itself in reaching out directly to schools as opposed to just ALTs. After contacting each ALT in the prefecture to get their schools’ addresses (although some did not respond, more than half provided the necessary information), Committee members then used the micro-grant money to print and mail around 100 information packets to the schools (Figure G). ALTs can indeed do a lot in informing their schools of the HJSF’s existence, but through directly mailing packets to the schools, the HJSF Committee believes it will increase its legitimacy in the eyes of principals around the prefecture and increase overall awareness of the HJSF within the larger public education community. Figure G: Japanese-language leaflet sent directly to schools. English abroad, thereby increasing their global awareness and helping lead them on the path to becoming true global citizens. By introducing their culture to others and in turn learning about the places in which they study, they can participate in meaningful cross-cultural communicative experiences by using English as a common language. The micro-grant received from USJETAA helped in this endeavor by giving the HJSF Committee the financial security from which to establish a more permanent place within the Hiroshima JET community. Again turning to the responses from the two recipients, perhaps the most important thing to come from this endeavor from the viewpoint of the HJSF Committee members is that the recipients themselves feel not only that they were consistently treated with kindness, but that the HJSF Committee is genuinely invested in improving the lives of students in Hiroshima Prefecture. Indeed, their willingness to use their experiences to help promote the scholarship in combination with the Committee’s new website and increased outreach activities will hopefully ensure that the HJSF continues to serve Hiroshima Prefecture for the foreseeable future. 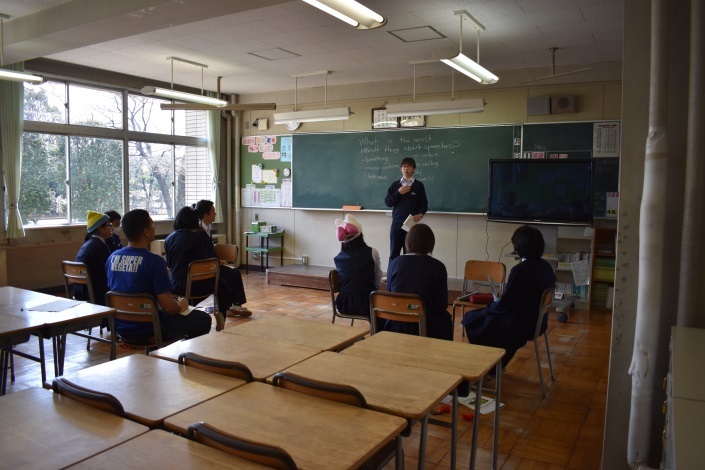 Impact: The grant strengthened Yoshino Junior High School’s English program by shrinking the gap between book-learning and speaking. On behalf of the students and teachers of Yoshino Junior High School, Makoto Reed Inouye would like to extend his heartfelt thanks to USJETAA for the chance to strengthen the English program and help the students here. The ALT can happily say that this project successfully met its goal of raising students’ confidence in both listening and spoken English. This project would never have been possible without the help of this micro-grant. The original premise of this project was to provide voice recorders to the students involved in taking the winter Eiken examination in January/February 2018. This project was executed in two phases. First, was the employment of the recorders for as level targeted listening practice for all of the second-year students. Second was the implementation of the voice recorders as take-home tools for students preparing for the interview portion of the exam. In the future, while the voice recorders will be further introduced into the classroom, these two project phases will repeat for each of the three Eiken tests proctored each year. The original stated project completion date was January 31, 2018. However, the ALT failed to take into account the time necessary for the Eiken Foundation to grade and return the results for both the written and interview phases of the examination. Thus, final completion of this project occurred on Tuesday, February 27, 2018 after the final results of the exams were received. All grant monies were spent in purchasing the voice recorders. These recorders were selected for their reasonable price point, relevant features, and build quality. Unfortunately, there was not enough money to purchase Eiken study books. The ALT went over budget and into his own pocket by purchasing a single plastic case to contain and organize all the voice recorders since the seller did not include individual protective cases. This solution was chosen due to the fact that the purchasing of individual cases for each of the recorders would have led to a more expensive and disorganized storage solution. As a direct result of the availability of recorders during phase one, the students were able to engage in specialized listening practice in preparation for the exam. This made the class time much more effective by allowing students to challenge themselves with level-appropriate listening tasks rather than wasting time on less difficult and less relevant preparation materials. For phase two, all students who qualified for the interview successfully passed it. The voice recorders provided them the opportunity to at least double their verbal output during their extracurricular interview practice time. This was executed in conjunction with mock interview simulations that the ALT created and made available to them online. The single limitation for the recorders’ use at this phase was the lower-than anticipated number of students who decided to take the level three test. This project has undoubtedly contributed to the successful shift in Yoshino Junior High School’s attention to English education. With the exception of one absent student, all second-years took this Eiken exam (a 47.6% increase in total examinees as compared to last year). The resulting pass rate was 87% (a 21% increase from last year). Listening scores were on average 3-7% higher than the mean for all examinees. While most of the credit must go to the students’ diligence, it must be remembered that this project’s voice recorders facilitated efficient use of class and personal study time for all students involved. Beyond the initial impact of this project, the voice recorders will continue to provide support both inside and outside the classroom for students. While full implementation will require extra training, these tools will provide a valuable opportunity to alter the current dynamic of lecture style classroom learning, increase the student verbal output ratio, and provide students both useful learning tools and a less judgmental context to help the bridge gap between book-learning and speaking. It comforts the ALT to know that, as the property of Yoshino Junior High School, this gift from USJETAA will continue to serve interested elementary and middle school students beyond the ALT’s time here as the Yoshino ALT. Impact: The grant gave the students an interactive way to study English that will continue to impact them through the rest of their English language education. 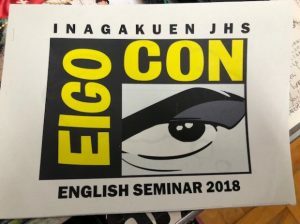 This year’s English seminar at Inagakuen Junior High School was even better than previous years. In the past, ALTs from other schools would come to participate and help third year students improve their speeches for the seminar. The students would compete, and the winning speech would normally win a certificate. Because of the micro-grant, we were able to award the top two students with plaques, 3rd-5th place winners were given framed certificates, and all top ten students were given a gift. Also, because of the grant, students were able to enjoy an activity that allowed them to win prizes throughout the seminar. Lastly, ALTs were able to wear costumes based on the theme and enjoy lunch that was provided. The micro-grant really helped enhance the English seminar experience for both teachers and students compared to previous years. This year’s theme for the English seminar was Eigo-con (English Comic-con). Students and ALTs wore costumes of their favorite comic book/anime/manga characters. Some characters represented during the seminar were Pokémon characters, Superman, Cat Woman, Dragon Ball Z, and etc. The autograph booklets were booklets that were designed to encourage students get to know the visiting ALTs and speak English. Each student was given a book that resembled a comic book. Each page contained three facts about each ALT. However, the students didn’t know what information belonged to what ALT. Students had to go to each ALT and ask questions to match the ALT and their information! If they matched the right ALT with their information, they were given a sticker on that page. The top 30 students to finish getting stickers in their booklets were able to get small gifts. Introductions- during introductions, all ten visiting ALTs and their anime characters were introduced. All students were put into teams of ten students and assigned to an ALT. Icebreaker/introduction activities – The students and their ALTs were taken to their classrooms and were able to play icebreaker games to get to know the ALTs. 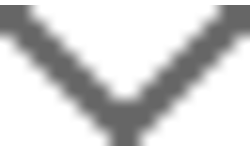 This activity was prepared by the ALT. 2. Speech practice (x 2) - There were two speech practice sessions. This is where ALTs needed to assist students with practicing their speech, and gave advice on how to improve their speeches! The ALT was free to use any activity they felt would be helpful. Speech competition within their groups- The students did their speeches with their PowerPoint presentations during this time. The ALT had to choose one winner to go to the finals. They had to evaluate all speeches and give feedback. 4. Final competition- All ALTs judged and decided 1st to 5th place winners out of the top ten performances. This seminar was the largest one to date. The ALTs were able to make an experience that was very memorable: for a few of them, they have participated in our seminars a few times, and have voiced that this one was their favorite one yet. Due to the grant, we were able to provide all teachers with food for the work day. For the students, they were able to be even more engaged with the theme. In previous years, students were not allowed to wear costumes or receive gifts for the activity game. This year, the students were more excited to participate. The top ten students were very happy to be recognized for their hard work, and were happy to have received gifts. In the beginning, the vice principal and some of the teachers were a little apprehensive because of the grant and my grand ideas for the seminar: only because they were thinking of future years for the seminar, and were worried that I may have set the bar “too high.” However, the ALT made sure to get decorations and prizes that would last for the next few years. The teachers, students, and ALTs were very happy with the outcome. The ALT hopes to have created a blueprint for Inagakuen Junior High School to follow, so that not only will the English seminar be a helpful tool to engage in English speaking, but will also create a great experience and memories for all parties involved. Impact: The grant gave the students of Amino High school a hands-on opportunity to practice English with native English speakers and exposed them to American culture through engaging cultural events. The event was held on Saturday, December 16th, the 2nd “American Day” event from 11am-3pm at Amino High School. Unfortunately, the local American military personnel invited could not attend due to administrative issues. Two other American ALTs, Amy McGreevy and Jeremy Odden, attended the event. Five English teachers from Amino High School chaperoned the event along with the grantee. There were about 15 students who were able to attend the event, though some had to leave after Lunch Break. The event started with a small Opening Ceremony. The chaperones introduced themselves and talked about their own experiences of America. The event used icebreaking activities, which included lining up by name, birthday, number of siblings, and other information. This allowed the students to use very easy and basic questions to get to know each other and the visiting ALTs. After that the students were divided into teams, with each ALT leading one team. Two team games, Pictionary and Taboo, were played. The winning teams were awarded points in the form of decorations on their team Christmas Tree. Next, there was a lunch with oven-baked pizza, and drinks and chips imported from America. At the end, Christmas-themed cookies and cookie decorating tools were provided. After lunch were Team Activities. Mystery Word was up first. Each team was provided a worksheet. At the top was a mystery word that needed to be deciphered. The hints given were descriptions of Christmas-themed vocabulary. The Teams had to figure out which words the hint was describing. Once they had an idea, the students had to go to a table where different Christmas words were written. Some words were also intentionally misspelled. On the back of the correctly spelled word would be a letter. All the hints together gave all the letters of the Mystery Word. After that each Team had to unscramble the letters and guess the word. After Mystery Word was Christmas Trivia. The trivia included True or False questions about the origins of American Christmas traditions. They were very hard questions that even many Americans would not know. So it was a learning lesson for both the students and the ALTs. Next was Team Origami. The ALTs were given origami paper. The students were given instructions on how to fold Christmas-themed origami crafts. The students had to tell the ALTs how to fold the origami. The ALT could not look at the instructions, but only listen to their team’s explanation. The team who correctly made the most origami crafts was deemed the winner. After that was the Christmas Song Dictation. The students were given the lyrics to “Rudolph the Red-Nosed Reindeer” with many key phrases left blank. The ALTs had to sing the song, from memory, to their team while the students tried to write down the lyrics correctly. Each ALT could sing the song as many times as was needed. At the end the work was reviewed, with each wrong word or misspelling taking a point off. The team that had the most points won. At the end the points were totaled and awarded 1st, 2nd, and 3rd prize. 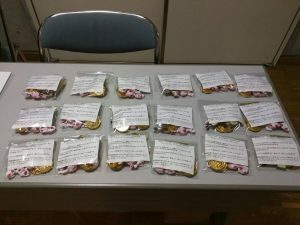 The 1st place prize, awarded to each student in the team, was a candy gift bag as well as their choice of a famous Children’s book (written in English of course). The 2nd and 3rd place prizes were also gift bags. The students had a very fun time interacting with the ALTs in English. They really loved the Mystery Word activity because they got to decipher and solve the puzzles. They also got to run around back and forth trying to figure out the correct spelling of some of the harder vocabulary. During the Christmas Trivia many of them learned a lot. They were aware of some Christmas traditions but many believed that they had started in America. They also really enjoyed trying to teach the ALTs how to fold origami. They really enjoyed talking freely with the American ALTs. They loved learning about the different traditions and just general experience in America. During the lunch break they happily asked the ALTs about America such a Christmas traditions and American celebrities. The students got a better insight into American culture and developed a stronger English in speaking English as well as more confidence in talking to foreigners. Impact: The grant gave students the opportunity to interact and engage with people of many different nationalities. They were able to learn about the different cultures and the students had the opportunity to engage with different people in English outside of the classroom. 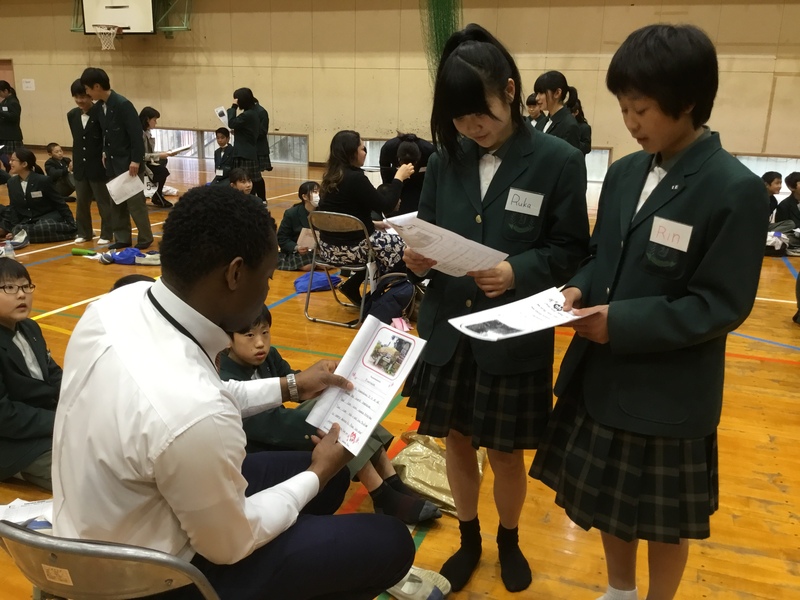 International Day at Yukuhashi Junior High School started as out as a goal Emmanuel Tarr made after attending a similar international event at another junior high school in Fukuoka Prefecture as a guest last year. When the ALT heard about the Micro-Grant Initiative, he thought that this would be the perfect way to fund guest transportation and make this goal a reality. The first grade at Yukuhashi Junior High School consists of 187 students mostly living in Yukuhashi City, as well as surrounding towns. Participating teachers from this school totaled to 22 excluding Emmanuel. Through this event, teachers of subjects other than English, got a chance to teach with ALTs for the first time or to sit alongside their students and learn with them. When the ALT signed up for the event, he originally wanted to hold the event on a Saturday, as a way to get ALTs from around the prefecture to come in their free time. However, when the ALT discussed this with the administrators at his school, it became clear that it was too late in the academic year to schedule a school event on a Saturday. Fortunately, the administrators were willing to hold this event on a school day, and they decided on Friday, March 16th, 2018. 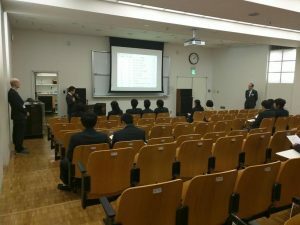 Finding 20 foreign guests and 10 Japanese guests to come to the school on a weekday afternoon was at times a bit challenging due to scheduling conflicts, but not impossible. Administrators at the school were happy to write and send out official work outing request forms and 20 foreign guests from a total of eight countries (USA, Jamaica, Canada, Trinidad, Singapore, Germany, New Zealand, and Ireland), and nine English speaking Japanese guests were recruited. An English teacher from the host school who teaches different grades stood in place of a guest who was scheduled for surgery on the event day to complete the guest list. For the event, first grade English teachers and the ALT had the students prepare compositions about places in Yukuhashi that they would recommend to a visitor. After the students completed these compositions, they were compiled into “Yukuhashi Guidebooks” (one book per each of the five classes). The students read their compositions to the guests. This period of time was followed by an interview between the students and the guests. Since this event was on a school day, having a tea party would interfere with some school rules regarding giving snacks to students during school hours. Further, the ALT wanted the students to have a deeper interaction with the guests and their cultures following the book reading and interview period. What better way to have students learn from the guests other than to have the guests teach cultural workshops? They planned for six simultaneous cultural workshops in classrooms located around the school to follow the book reading and interview. These workshops were English Calligraphy, Cooking, Dance, English Conversation, Sports, and Hawaiian Crafting. All of these workshops were joint-led by JET Program participants, Japanese guests from the community, and staff at the school. Prior to the event, students were given surveys asking them to choose their top four workshops, and the students were divided based on the results of these surveys. The English calligraphy workshop was led by an American JET, a Japanese professional artist and business owner living in Kitakyushu City, an Irish ALT employed by Yukuhashi City, and two English speaking Japanese members of the local community. Students learned strokes of English calligraphy fonts and practiced writing words of their choice. 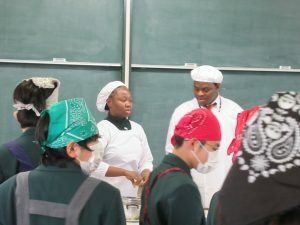 The cooking workshop was led by two Jamaican JET Program participants, a Canadian ALT employed by Yukuhashi City, a first grade English teacher from the host school, and an American JET program participant. The students cooked Jamaican saltfish fritters. The dance workshop was led by an American JET Program participant, a Japanese professional artist and dancer who had returned from living in New York City after over 20 years, a former JET program participant and current masters candidate from Asia Pacific University in Beppu, Oita, and a Japanese former study abroad participant to the USA, and an English teacher from this school. Students learned the steps to the Cha-Cha slide. The English conversation workshop was led by six JET program participants from the Singapore, Germany, Trinidad, and the USA, a Japanese teacher of English employed by Yukuhashi city, a Japanese private English tutor, and a Japanese English teacher from the host school. 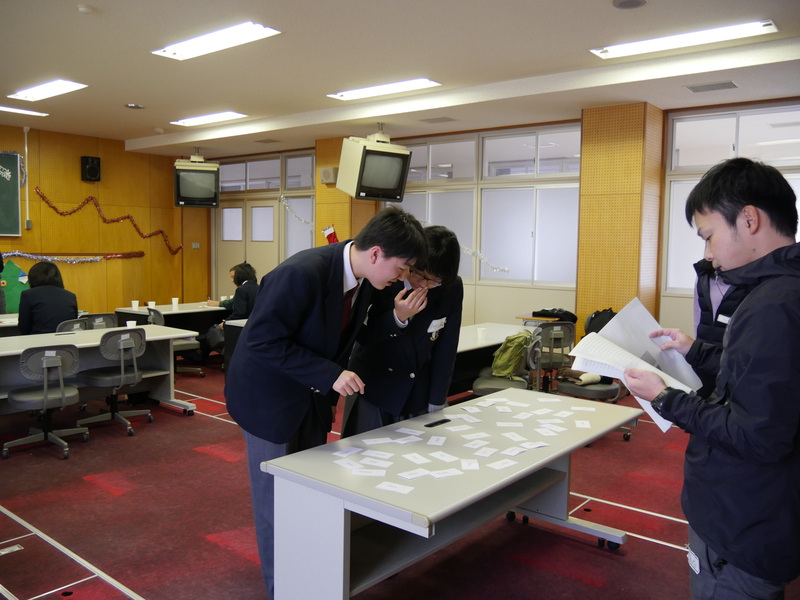 Students were divided into five groups, and did ten minute rotations with three of the five of the foreign ALTs, each practicing English interview questions and playing different English games. The sports workshop was led by a first grade PE teacher from the host school, an American JET program participant, a JET program participant from New Zealand, an ALT hired by a private dispatch company in a nearby town, and a former JET program participant and current masters program candidate at Asia Pacific University in Beppu, Oita. The students learned how to play Ultimate Frisbee. The Hawaiian crafting workshop was led by two American JET Program participants, an English teacher from this school, a Japanese member of the local community and resident of Kitakyushu city. Students made Hawaiian leis out of yarn and ribbon. 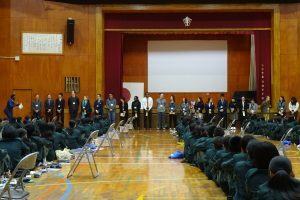 Students often find it difficult to express themselves and to ask and answer questions in English, so upon telling them the objective of the international event, students worked very hard to make themselves understood in English to foreign and Japanese guests alike. This struggle gave students more motivation to learn and practice English. In one student response, a student mentioned that this opportunity made her want to learn more vocabulary. Other surveys indicated that many students were surprised that the guests made the effort to speak in easy English. After reviewing student reflections to the event, it was apparent that many students enjoyed sharing about their city with the guests. One student said that he wanted to share even more good points about Yukuhashi with the guests when it was all over. 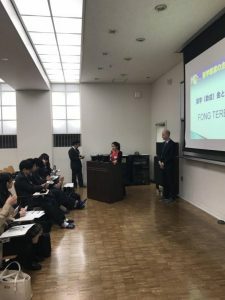 One student said that she was happy that the foreign guests could understand her English, and that this experience made her less fearful of interactions with foreign people. Many students said that it was a good opportunity to know about foreign cultures, customs, and new things that they didn’t know about the world before this event, such as “There can be many different styles of writing in English calligraphy,” “Fritters made with fish, green peppers, yellow onions and green onions can actually be delicious,” “Speaking English can actually be fun,” and that “Leis can easily be made with yarn and ribbon.” According to an English teacher at the school, even teachers could view this event as a good opportunity to listen to and get used to varying English accents and expressions. As the first grade students are just finishing the beginning of their junior high school English curriculum, the positive reactions to this event indicate that they can now have confidence in their ability to communicate in English, as well as a context for the language learned in their English classes. Further, the positive reactions to the guests indicate that the students are optimistic about communicating with people from different countries. This optimism can be a motivating force for them to enthusiastically continue their English study. 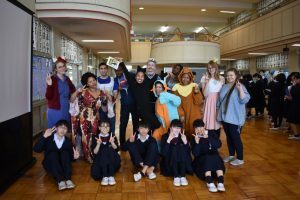 Due to the positive reactions by students and staff, the administrators of Yukuhashi Junior High School have stated that they would like to hold International Day annually and expand to other grades as well. 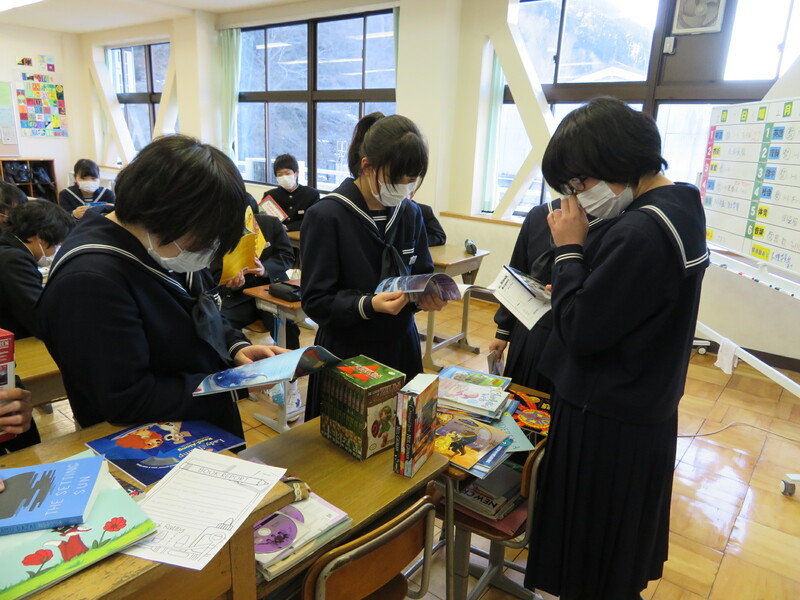 Impact: The grant gave students access to books written in English that will continue to impact future students in Mugi Junior High school’s English classes. With support from the micro-grant initiative, Mugi Junior High School now has a small English library containing books, movies and games, and classroom resources to expand and encourage the use of English in conversational settings. The library is set in the English classroom and items are to be kept on the school’s premises. Careful research was conducted to find items that would be of interest to those of various English levels. Since the time of receipt of the library’s items were varied, students were excited to see new books displayed every month during the time of the project. Students were free to enter the English classroom during break times to access the books in the library, giving them the choice to read at their own pace. Movies, games, and tablets are kept in the school’s office to be used in formal classes and clubs. Despite initial issues with the original tablets purchased mentioned in previous reports, the final set of tablets have proven to be successful in increasing the usage of technology and group activities in the class. Students particularly enjoy Kahoot! quizzes as an interactive way to review content. With Skype installed in all of the tablets, it is hoped that students will be able to use the tablets to communicate and exchange videos with people around the world in the future. With the tablets, the school has a way to incorporate technology in the English classroom for the junior high school students, encouraging them and teachers to use the resources to expand their perspective on the world. Prior to the library, English-content exposure was limited to the textbook and its resources. 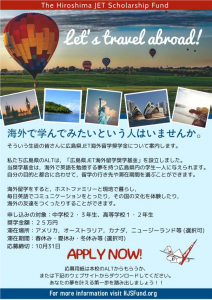 Now, Mugi students have the opportunity to explore their interests and learn English in an engaging manner. Though the library is located in the junior high school, its contents are in English classes at the elementary school, nursery school, and the adult conversation class at the community center. Books are used in the schools, while resources including the games and conversation cubes are used for all levels. 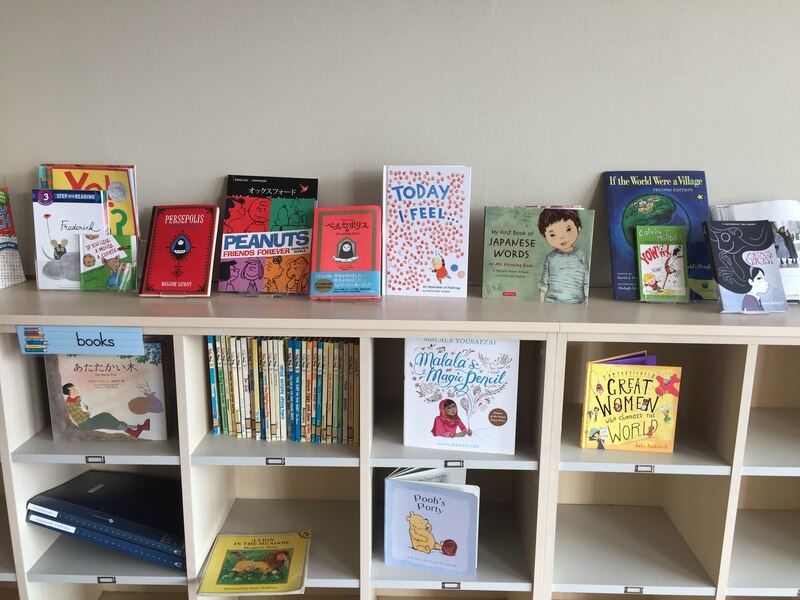 The library has affected all English learners in Mugi Town to an extent by providing out-of-textbook English experiences to increase engagement and inspire English-language learning. Impact: The grant gave students access to books written in English that will continue to impact future students in Ikuno Junior High School’s English classes while giving current students the opportunity to practice their English writing ability. A budget of $900 USD was provided through the America Micro-grant Initiative to grantee Matthew Wong; an employee of the Asago City Board of Education in Hyogo Prefecture, Japan based at Ikuno Junior High School. The grant was provided to the grantee to purchase books in English for the grantee’s school library. Books were selected for meeting one of two criteria: the first criterion was the targeted reading ability, i.e. LEXILE score; and the second criterion was the subject matter, i.e. a female main character or a historical narrative about Japanese internment camps in the United States. The books were presented as additions to the school library and introduced to individual classes. The book report format was also introduced. Students were expected to check out books from the school library using the pre-existing library check-out system and then fill out book reports. The book reports were sourced from open-source education materials found on the Internet. Every grade level was allowed at least one 50-minute class period to read books in a silent-sustained environment to be introduced to the reading materials. The students who were able to finish books, either due to ability or motivation, then filled out book report templates provided by the grantee. Students actively engaged in the reading and were excited to read stories about characters from popular media in Japan such as comic book heroes and Disney characters. 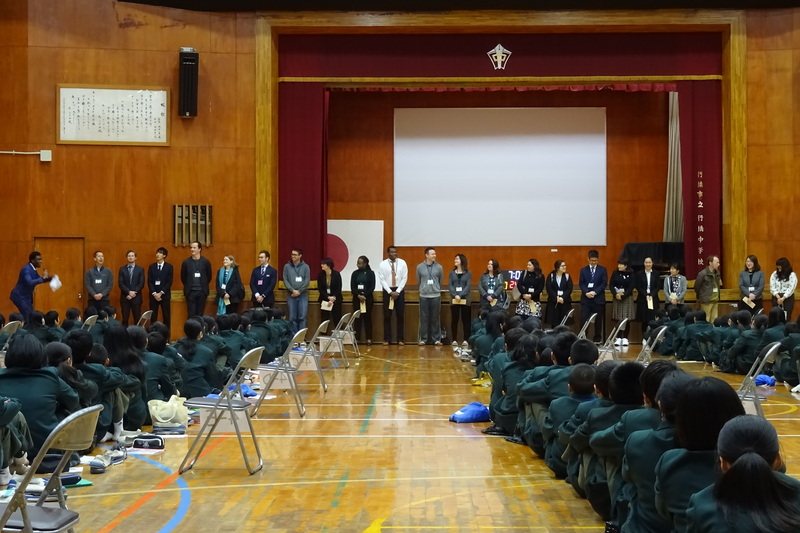 The audience of this project was any and all students studying at Ikuno Junior High School. The books are now permanently integrated in the school library collection. The grant also provided budget to purchase a shelving unit to hold all the books in a single location. The books have also been added to the school library check-out system and are freely available to any Ikuno Junior High School student present or future for check-out. With the books added to the permanent collection of the school library, current and future students will have access to the books. 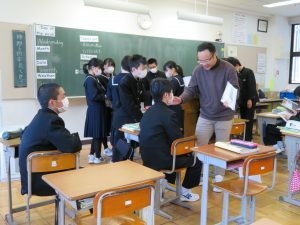 The academic culture and nature of junior high school education places an undue burden on teaching staff to prepare junior high school students for high school entrance exams. To that end many engaging or ‘fun’ activities or educational ideas are replaced by less engaging modules in favor of preparing students for exams. Students were excited to hear about this Micro-grant. Books and the school library will be available to students outside of class time and the students may peruse and read at their leisure. Students verbally commented that their interest in reading interesting books in English had increased. The grantee and English teaching staff observed a 100% participation rate during the devoted silent sustained reading periods across all students of all abilities. There was a wide enough variety of books to address the range of English reading abilities and topic interests of respective students. The project succeeded in introducing students to authentic English reading materials with stories/novels often found in Japanese media; e.g. Lewis Carroll’s Alice’s Adventures in Wonderland, Marvel and DC comics, and Beatrix Potter’s The Tale of Peter Rabbit. Students were also introduced to stories that could help promote critical thinking and tie into or supplement Japanese junior high school curriculum; e.g. third-year social studies modules on human rights (books were purchased about Japanese internment camps in the USA) or second year social studies modules on the transatlantic slave trade (books were purchased about Black Americans and discrimination). The students were introduced to and have access to these English reading materials on complex ideas aimed at the primary school level. The project fails in the aspect that there is no major incentive to read other than personal edification and personal motivation to read books in English. Stickers were bought to incentivize students, but stickers are small prizes for an emerging reader reading a chapter book. The school discourages foodstuffs being transferred from teachers to students so commonplace Accelerated Reader-esque prizes such as ‘pizza parties’ are not options. A future direction could be an Accelerated Reader program equivalent with points and reading comprehension quizzes but that is outside the scope, time, and budget of the awarded grant. If allowed, a similar grant for the local city library would be more effective at reaching more students at younger ages. The city library actively utilizes its English book section with a higher profile of advertising and English story reading time events. (Disclosure: the grantee is a volunteer and reads English books to young children who attend the library’s English story time). 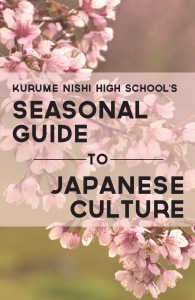 Impact: The grant gave students at Kurume Nishi High School the opportunity to practice writing in English while learning, engaging, and becoming more aware of their own culture. As written in the first page of the booklet: “This booklet collects speeches written by second year students at Kurume Nishi High School. Students were asked to present about a unique part of Japanese culture. Not only did students struggle with describing familiar experiences in a foreign language, they were also forced to consider their topics from the perspective of someone with little to no knowledge of Japanese culture.” This project originally addressed only a small group of already motivated students who would seek out additional English practice on their own. However, given that making the project more expansive would benefit more students, it was decided that the project would be simplified (that is, instead of longer news-style articles, shorter essays that all students could write) and made part of the second year students’ regular curriculum. 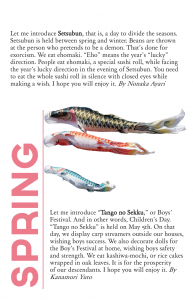 Rather than a newspaper, the final project is a pocket handbook of Japanese customs and traditions. Given that there were over 250 total speeches, only a small portion were put in the booklet. These were chosen not only for their quality, but also because they were easy to group and organize seasonally. There were many excellent speeches that were not chosen simply because there was not an easy place to put them. Therefore the speeches chosen do not necessarily represent the best of group. This assignment is not only a language learning activity, but also an exercise in seeing Japanese culture - and thus students’ daily lives - from an outside perspective, and considering what might be unique about Japanese culture for foreigners. Students learned more about foreign cultures - particularly American culture - through writing about Japanese culture. That is to say, in the process of writing their speeches, students had to compare Japanese customs and traditions to the rest of the world’s customs and traditions in order to properly express the uniqueness of the topic they chose. While discussing possible topics, many students did not realize that certain things were uniquely Japanese (for example, there is no bunkasai in America) or that certain things were not uniquely Japanese (for example, Halloween is not from Japan). Students were graded not only on mechanics (grammar, syntax, etc.) and presentation (eye contact, body language, memorization, pronunciation, etc.) but also on the logic and content of their speeches. Of particular note is whether or not students, in describing their topics, were able to get to the heart of the matter and give the audience the most important information. For example, a high scoring speech about Hinamatsuri will mention that Hinamatsuri is a holiday celebrating girls, and primarily celebrated by families with girls. To a Japanese person, this point may seem obvious and thus not worth mentioning, but for foreigners who did not grow up knowing about Hinamatsuri, this is a crucial piece of information, without which the existence of the holiday makes little sense. 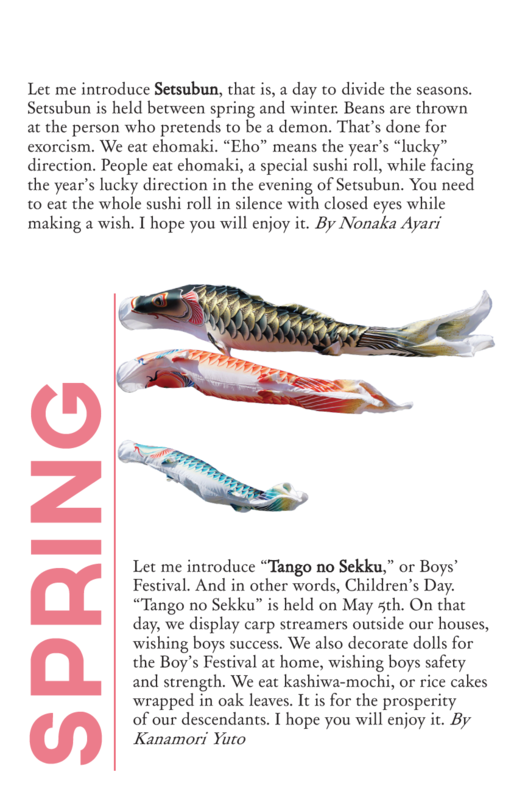 However, a lower scoring speech about Hinamatsuri may only describe Hinamatsuri as a holiday where one decorates dolls and eats hina arare. In other words, the most important question for students to keep in mind was, “What’s the point?” Students were also asked to bring a visual aid - an item, photograph, or drawing that not only paired well with their speech, but properly encapsulated the important elements of their topic. 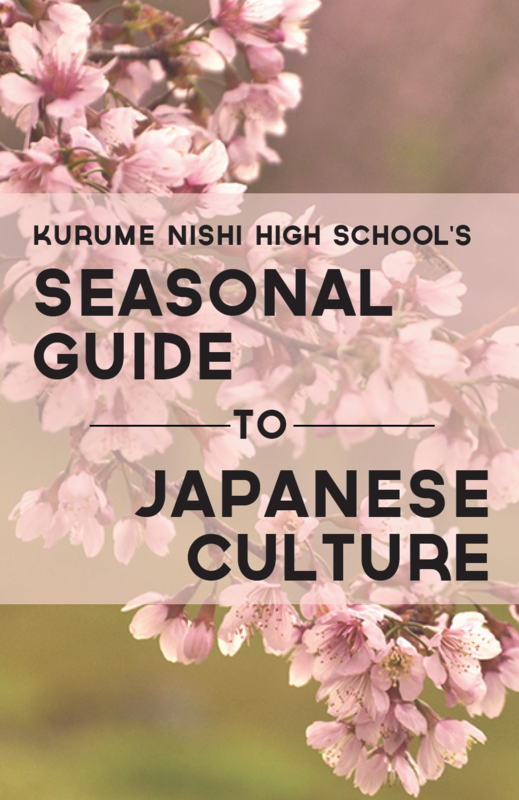 The audience for such a publication is foreigners interested in learning about Japanese holidays and customs, particularly those interested in seeing Japanese traditional culture from the perspective of young people. This particular booklet, however, was intended as an exercise, in preparation for future interactions with foreign visitors, in discussing Japanese culture with those unfamiliar with it. In that sense, this activity operates on a similar logic to Welcome to Tokyo, which attempts to give students the knowledge and language necessary to explain aspects of Tokyo in English to foreign visitors. For example, in order to simulate speaking to non-Japanese people, students were required to define or translate literally every Japanese word they used, even commonly understood words like kimono or umeboshi. Thus, it is not actually intended for distribution.